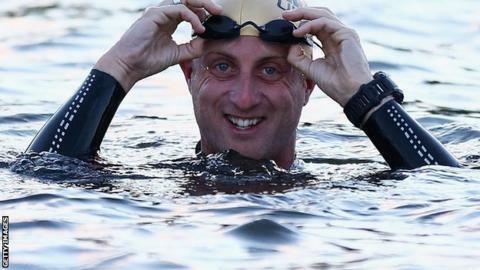 UK Ironman champion Dan Halksworth will represent Jersey in the triathlon at the Commonwealth Games in Glasgow. The 28-year-old successfully defended his national Ironman title in August and has now been chosen to compete over the shorter triathlon distance. Halksworth told BBC Radio Jersey: "I'm a proud Jersey boy so to be able to represent Jersey at the Commonwealth Games is big for me. It's huge. "I am looking forward to the experience and being with the Jersey team." Halksworth won the Jersey Triathlon in 2013 in a time of one hour, 57 minutes and 58 seconds. "I'm more of a long-distance Triathlete," he added. "I've been to the Commonwealth Games before but this will be a different sport this time around. "It's nice to now be able to relax a bit now and focus on my training and my racing. "I'm going to go out there, give it everything and hopefully get a good result. "I'm really looking forward to it and being able to support other sports as well and have that good, team feeling around me. "Obviously Ironman is a very individual sport. I'm swimming, cycling and running on my own a lot so having a team around is going to be a great experience. "I'm hoping that we're going to have great support with us as well. "Glasgow is not too far away and it would be good to see as many Jersey people up there as possible."